I love baking shortbread. They’re so quick and easy to make that I find myself baking shortbread quite often when I need a simple sweet treat. For my latest shortbread adventure, I looked to a favorite flavor combination – chocolate and peanut butter. 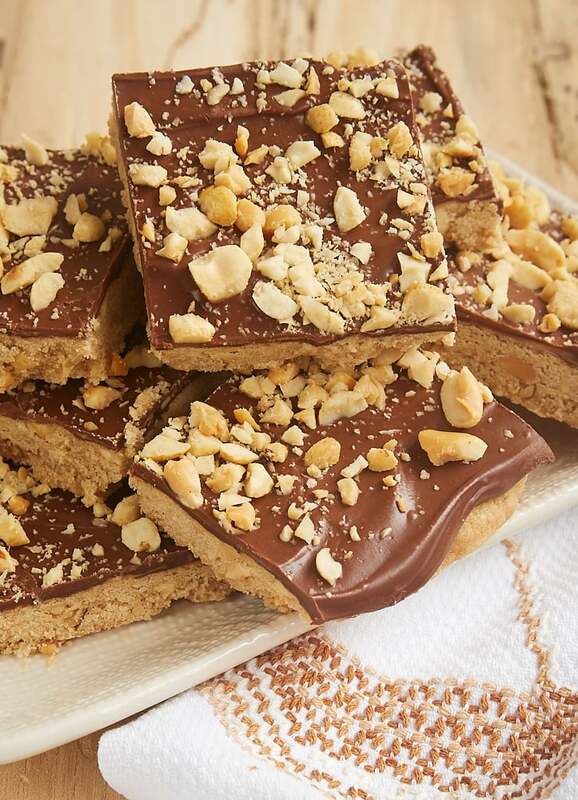 These shortbread are made with both peanut butter and peanuts for plenty of peanut-y flavor. They’re pretty tasty all on their own if you’re looking for a lightly sweet and simple cookie. 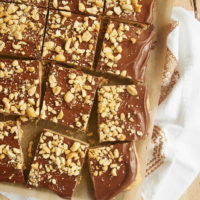 But the chocolate-peanut butter topping is just the thing to make these Chocolate Peanut Butter Shortbread irresistible! Measuring ingredients accurately is always important in baking, but I think it’s especially important when making shortbread. So many inaccuracies occur when measuring flour. Too much flour in shortbread, and your dough just won’t hold together. If you need a refresher, be sure to review my tips for measuring flour. Even with perfectly measured flour, shortbread dough is pretty crumbly once it’s mixed. But if you pinch it, you’ll find that it holds together just fine. After you transfer this dough to a sheet of parchment paper, just work it with your hands and pat it out into a rectangle. You can opt to use a rolling pin, but I find that I can get it shaped and evenly flattened with just my hands. The topping for this shortbread couldn’t be simpler. Just sprinkle chocolate chips and peanut butter chips over the top of the shortbread when it comes out of the oven. Then spread it over the top until it melts. As it melts and spreads, the two different chips will mix together. Sprinkle with chopped peanuts, and you’re done! These shortbread are so, so good. The shortbread themselves are a little crunchy on the outside, soft on the inside. And the chocolate-peanut butter topping is the perfect complement. 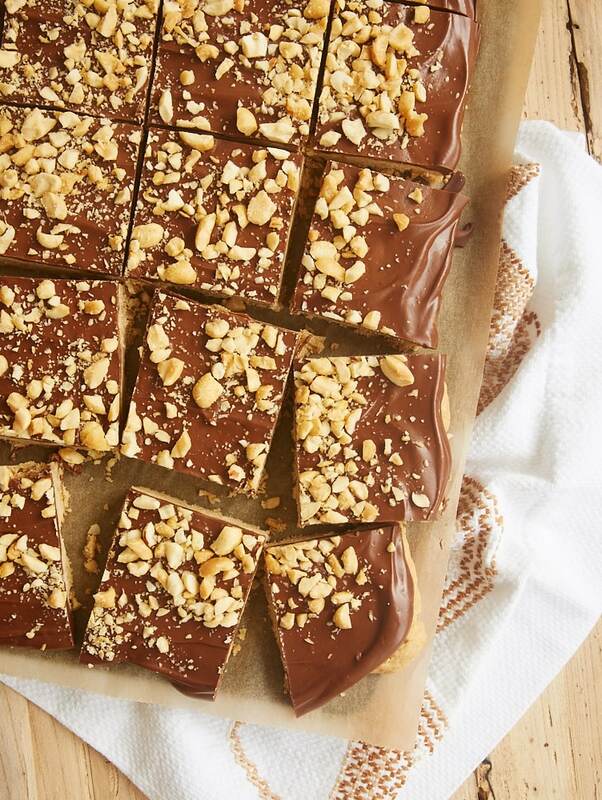 If you’re a fan of easy recipes and chocolate and peanut butter desserts, these are a must-bake! 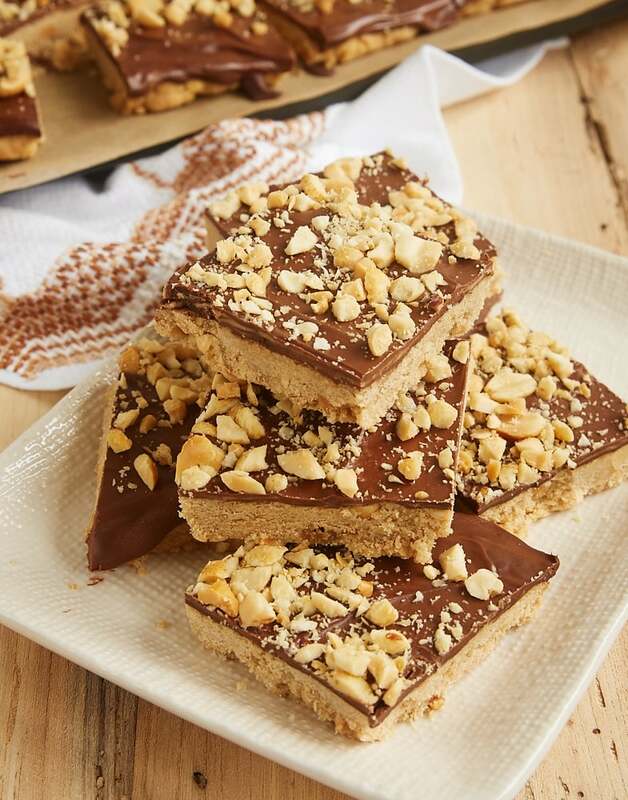 If you love chocolate and peanut butter, do not miss these quick and easy Chocolate Peanut Butter Shortbread. A favorite one-bowl dessert! Using an electric mixer on medium speed, beat the butter, brown sugar, and peanut butter until thoroughly mixed. Add the cornstarch, vanilla, and salt, and mix well. Reduce mixer speed to low. Gradually add the flour mixture, and mix just until combined. Stir in the peanuts. The mixture will be crumbly but should hold together when pinched. Transfer the dough to a sheet of parchment paper. Use your hands to press the dough together and pat out to a rectangle about 11″x 14″. Transfer the parchment paper and dough all at once to a rimmed baking sheet. Immediately sprinkle the chocolate chips and peanut butter chips over the top of the shortbread. Use an offset spatula to spread the chips over the top of the shortbread until they’re melted and smooth. Sprinkle the peanuts over the top. *These can be cut in several different ways. I prefer squares, but don’t forget about triangles, rectangles, and more.